The production is, in many ways, similar to its original staging in 1895 – the costumes, mannerisms, dialogue – with one inescapable twist. Wilde’s script, subtitled “A Trivial Comedy for Serious People,” quickly reveals itself as a coy satire of the Victorian era in which he lived. British to its core, it treats the social expectations and mores of his time with farce and witty yet ultimately insignificant banter. The production at the Luna, presented by the Community & Arts Project Services group, has not altered the approach nor the inherent British-ness of the original. The script, translated into period-parallel Japanese by Koji Nishimura, has the actors carrying on the conversations in their native tongue while creating an environment of English high society. “Basically, I think we all just try to forget about being Japanese, and do our best to be the characters,” said Eiji Inoue, who plays Rev. Canon Chasuble, the local parish priest caught up in the confusion. 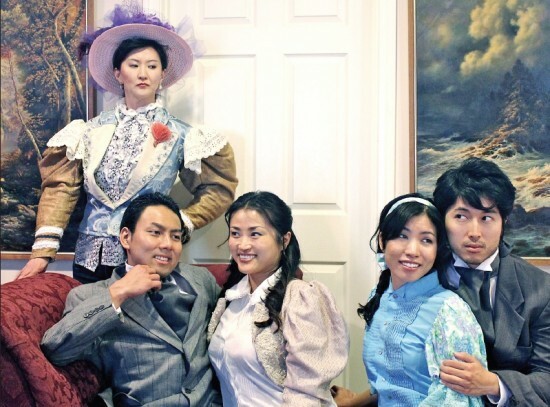 South Pasadena resident Mie Aso, who portrays the governess, Miss Prism, brought an English copy of the script to rehearsals, in an attempt to get a feel for the characters’ sensibilities. “I think from the text, which is very well translated, you get the sense of how the characters think and live,” Aso explained. Actress Sachiyo K said she did a good deal of research for her role as the doting matriarch Lady Bracknell, but avoided watching the 2002 film directed by Oliver Parker. “I didn’t want to imitate Judi Dench, I just wanted to get a feel of the character in my own mind,” she said. Kazumi Zatkin, who takes on the role of the marriage-ready Gwendolen, is also co-producer of the Luna production. She said the idea of staging “Earnest” came from fellow producer Aramazd Stepanian’s frustration with trying a different take on the play. The play is presented with scrolling English captions, for audiences whose classical Japanese may be a bit rusty. Toda said that despite being from opposite sides of the planet, British and Japanese perceptions of humor are not worlds apart. “There is a real difference in comedy between America and England, but English jokes are more similar to Japanese comedy, dry and sarcastic, very silly sometimes, and Japanese can be very silly people at times,” he explained. “The Importance of Being Ernest,” in Japanese with English captions, has performances Saturday at 7:30 p.m. and Sunday at 2:30 p.m. The Luna Playhouse is located at 3706 San Fernando Rd. in Glendale. Tickets are $20, $15 if purchased in groups of five or more. For information, call (818) 450-4801 (English) or (818) 823-7067 (Japanese), or buy tickets at www.itsmyseat.com.